675: This triangular building, built as a factory c. 1849, houses Vento Trattoria, hip Italian. Downstairs is the restaurant's lounge, Level V, which used to be the gay leather club The Manhole, and before that the straight Hellfire Club. J's Hangout, an underground after-hours gay club, was here more recently. The building also contained Glenn Close's apartment in Fatal Attraction. (For real sexiness, try the Triangulo tango studios on the third floor.) Ed Harris lives in the north corner in The Hours. 652 (block): Catherine Malandrino, fashion designer. This is the address given for Glenn Close's loft in Fatal Attraction. 639 1/2: Elizabeth Charles, shop specializing in Australian fashion. 637 (corner): Frederick's Downtown, spendy French tapas, was the swanky Bivio. A sweet little place created in the early 1960s and named for a neighborhood kid who was killed in Vietnam in 1967. 633 (block): Writer John Cheever was living in a former building here, a teenaged dropout living on bread and buttermilk, when The New Republic published his first short story. Earlier, this address was the headquarters of the Hudson Dusters, a criminal gang whose territory was Manhattan below 13th Street and west of Broadway. They were shut down by police in 1916. 636 (corner): Hudson Bar & Books, clubby cigar bar, is one of only eight bars in New York City where you can legally smoke. Also Yoya, designer kids' clothes; Annelore, women's clothing. 634: Myers of Keswick, grocery specializing in hard-to-get British items. 607 (corner): Village Nursing Home. Marion Tanner, aka "Auntie Mame," died here in 1985 at the age of 94. Peter Warren, who owned most of Greenwich Village, gave his daughter Charlotte land around this square when she married Willoughby Bertie, the Earl of Abingdon. When New York was replacing British placenames in 1794, Abingdon Square was spared because the Abingdons had defended the rights of Colonials in England. Statue in the square is of a World War I doughboy. 581: Valdino West was Trattoria da Alfredo, an influential Italian that broke from red-sauce cliches; James Beard was a big supporter. Also Mappamondo Due. 575: Former French bar Papillon is now the English Cafe Topsy, with "impressive reworked Brit standards"--Voice. Also Tapastry, American tapas. 573: Constanca Basto, beautiful boutique selling shoes you can't afford. 578: Ma Ma Buddha-- a reliable Songlines source cites this as being "WAY above the standard of general quickie Chinese, but no more expensive." 567 (corner): A longshoreman's bar dating back to 1880, it became a literary hangout in the 1950s. Poet Dylan Thomas drank himself to death here; beat writer Jack Kerouac was bounced from here; novelist Norman Mailer conceived of the Village Voice here. Other habituees were James Baldwin, Anais Nin, Michael Harrington and Mary Travers (of Peter, Paul and...). Now kinda fratty. 559: Pepe Verde, affordable, tasty Italian. Also at this address is a secret restaurant run by Jill Donnenfeld; write to her here to request a reservation. 555: Visionary urbanologist Jane Jacobs used to live here. Many of her ideas in The Death and Life of Great American Cities come from her observing the "intricate sidewalk ballet" on this block. The Art of Cooking is on the ground floor. 548 1/2: The End of History claims to have "the world's largest collection of 1950s & 60's glass." Corner: There's a customizing/detailing shop here that's popular with cabbies. 531: Rubyfruit Bar & Grill, longstanding lesbian hangout. Named for Rubyfruit Jungle, a 1973 lesbian coming-of-age novel by Rita Mae Brown. Formerly Village Green. 518-510 (corner): These row houses were put up in 1826 by Isaac Hatfield; No. 518 (the corner) used to house the Blind Tiger Ale House, famous for its extensive selection of beer, bourbon etc. ; formerly One Potato. No. 516 is Falafel Hudson; No. 510 is Caffe Sha Sha, in the best preserved of the row. 506: Uplift! Art Deco Lighting is also the headquarters of the Human Cloning Foundation. 489-491: These row houses were put up in 1825 by Trinity Church, which owned St. Luke's. Corner: This Episcopal church was founded in 1820 to serve the growing Greenwich community; it was named for the patron saint of physicians, since many New Yorkers moved to Greenwich to escape Yellow Fever epidemics. One of the founders was Clement Clarke Moore, Chelsea landowner and biblical scholar remembered as the author of "A Visit From St. Nicholas." From 1891 to 1976 St. Luke's was a chapel of downtown's Trinity Church. 473-477: Also built in 1825 by Trinity. Corner: The beautiful Barrow Street Gardens were laid out in 1950--open to the public on Sunday afternoons and worth a trip. A tree grown from a cutting from the legendary Glastonbury Thorn--reputed to have sprouted miraculously from a staff cut from the tree that produced Jesus' crown of thorns--grew here from 1847 until 1990. 500 (corner): Was Christopher Street Books longstanding gay erotica shop. 490: John Melser Charrette School (pre-K-6)/Greenwich Village Middle School (6-8). When the Marquis de Lafayette, visiting the United States in 1824, asked to see "the best example of the public school system," he was taken here. Today the school has a special emphasis on creativity. 464 (corner): Green Gardens apartment complex (1926); note inner courtyard. 463 (corner): Barrow's Pub, neighborhood hangout. Opened in the early 20th Century as Lynch's, a "little dive bar by the docks" for longshoreman and sympathizers with the Irish Republican Brotherhood. 447 (corner): The front door of the Hudson Clearwater restaurant is made to look like it's boarded up; the real entrance is an unmarked green door around the corner on Morton. Corner (85 Barrow): Mutulu Shakur, mastermind of the 1981 Brink's robbery attempted by the New Afrikan Freedom Fighters, hid out here for six weeks after the bungled effort resulted in the deaths of a guard and two police officers. He was eventually apprehended in 1986. 435 (corner): En Japanese Brasserie, a multi-level restaurant that recreates a Meiji-era Japanese home. Hudson Garden Center was here. 424: Was the County Claremen's Evicted Tenants Protective and Industrial Association, a mutual aid group for immigrants from Clare in Ireland. 422: The Bespeckled Trout, a "general store," featuring ice cream, sodas and fishing lures. 420 (corner): The Chick Inn, down-home fast food. Formerly the Anglers & Writers bar. Originally the Trinity Parish Cemetery, where Edgar Allen Poe liked to wander when he lived in the neighborhood in 1837. Now a park named for NYC's scandal-ridden 1920s mayor. 395 (block): Home to Hot 97, the hip-hop radio station whose studios have become a traditional site for inter-artist rivalries to escalate into violence. In February 2001, a feud between Lil' Kim's posse and Foxy Brown's Capone-N-Noreaga crew broke into gunfire, resulting in one injury and a perjury conviction for Lil' Kim. The 50 Cent/The Game beef turned into a shooting here in February 2005. And rapper Jamal "Gravy" Woolard took a bullet here in April 2006--though it didn't prevent him from giving a previously scheduled on-air interview. 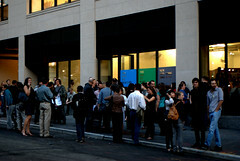 375 (block): Saatchi & Saatchi advertising agency; this building contains some of the extensive Saatchi art collection. Block (201 Varick): Designed by Albert Buchman and Eli Jacques Kahn, this was built in 1929 as the United States Appraisers' Stores Building, a federal building that warehoused goods seized by the Customs Bureau. During World War II, the building was reportedly used for secret atomic experiments. The Atomic Energy Commission moved offices to the building in 1959. 350 (block): Jacques Torres Chocolate Haven, a specialty chocolate factory, uses 250,000 pounds of raw chocolate a year and sells 600 cups of hot chocolate on a wintry day. 304 (corner): Home of Atelier New York, menswear, and the 289 Bar. 282 (corner): This four-story tenement was home to the Blues Bar, an unlicensed after-hours joint owned by Dan Akroyd where he and John Belushi worked on their Blues Brothers act in 1978-79. 250 (block): This 14-story mid-rise from 1930, designed by William Higginson, is home to Edelman, the world's largest privately owned PR firm, which represents such clients as Microsoft, Walmart, Shell and Starbucks. 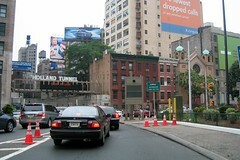 The Holland Tunnel entrance is right here, but you can't get in from this direction. 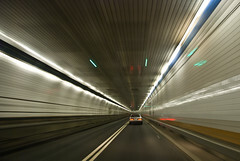 The Holland Tunnel, connecting Manhattan to Jersey City, was started in 1922 and completed in 1927, allowing cars to drive into New York City from New Jersey for the first time. Though the name evokes New York City's Dutch heritage, it actually honors Clifford Milburn Holland, chief engineer of the project, who died on October 7, 1924, the day before the tunnels dug from New York and New Jersey were con- nected. The project was completed by famed tunnel designer Ole Singstad, whose pioneering ventilation system allowed the Holland Tunnel to be the first vehicular tunnel of substantial length. Block (431 Canal): The Holland Plaza Building, a 1930 Art Deco structure designed by Ely Jacques Kahn for the printing industry, now houses the Metropolitan College of New York, founded in 1964 by Audrey Cohen, along with the Manhattan Center of Adelphi University, founded in 1896 as New York's first co-ed college. 205 (block): This five-sided, 12-story 1928 building (also known as 111 Watts and 480 Canal) was designed by Renwick, Aspinwall & Guard. It's home to SFK, aka Success for Kids--originally Spirituality for Kids--a Kaballah-inspired educational project backed by Madonna and Demi Moore. 195 (corner): Seven stories of buff brick built in 1929 as the headquarters of the U.S. Rubber Company, converted to condos in 1999. Jay-Z and Beyonce have lived here, holding their wedding here in 2008. 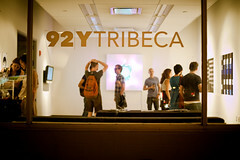 200 (block): 92Y Tribeca, the Downtown outpost of the 92nd Street Y. It used to be an independent Jewish arts center called Makor, which merged with its current parent in 2001. It's been at this location since 2008. 196: This address, in the same building, was the original location of Martin Guitars. 161 (corner): From 1989 until 2001, this was Wetlands Preserve, a center for music and activism that nurtured the Jam Band scene with acts like Phish, Dava Matthews Band, Blues Traveler and Spin Doctors performing regularly. Rage Against The Machine and Pearl Jam played their first New York gigs here, as were Oasis' first two U.S. shows. It closed when the building was turned into luxury condos; Mets catcher Mike Piazza bought the penthouse here in 2004. Corner: Thai House Cafe is well-regarded and relatively cheap. 145: Morgik Metal Designs and Asian antique store Abhaya (Sanskrit for "fearlessness" or "refuge"), are in the Hudson Square Building, 1929 Art Deco lofts by Renwick, Aspinwall & Guard. Corner: Pace is in the 1891 Castree Building. 124 (corner): Pompanoosuc Mills, Vermont furniture showroom, is in The Hubert. 122 (corner): Brown Harris Stevens, a real estate firm founded 1873, is in the Bendheim Building. Brown Harris' website claims that founder Charles S. Brown was a man of "uncanny prescience" because he recognized "as early as 1873" (!) that "the bucolic New York of the late 19th Century" would one day become "the nation's economic and cultural center." I think it's safe to say that Brown knew more about the future than his heirs know about the past. 119 (corner): The Spice Building, an 1888 warehoue, houses Tribeca Issey Miyake, a Japanese fashion retailer whose interior here was designed by Frank Gehry. The store was scheduled to open on September 11, 2001-- I imagine that was pushed back. 105: One of the most acclaimed, exclusive and expensive restaurants in Manhattan, this sushi mecca is co-owned by actor Robert De Niro and Nobu Matsuhisa, a genius chef born in Japan who spent his early career in Lima, Peru. Next door is Nextdoor Nobu, a slightly less expensive, less exclusive version with basically the same food. Both are housed in the Pierce Building (aka the Powell Building), an 1892 Renaissance Revival structure by Carrere & Hastings, architects of the NYPL. 120 (corner): Bubby's Pie Co., restaurant and bar opened in 1990. 108 (corner): 1904 building by George Howard Chamberlin is notable for its "rusticated marshmallow columns" (AIA Guide). Corner (6 Harrison): A beautiful brick-and-granite landmark with a picturesque tower, an 1884 design by Thomas R. Jackson. The Mercantile Exchange was Organized in 1872 by dairy merchants as the Butter and Cheese Exchange, NYMEX is now the largest physical commodities exchange in the world. The building, long since vacated by the Exchange, houses Chanterelle, super-fancy French; if you average the Zagat scores for food, service and decor, it would come out as the top restaurant in the city. Opened in SoHo in 1979; moved here in 1989. Also here is Local 1180 of the Communications Workers of America, which represents city workers in the public hospitals, Board of Ed, Transit Authority and Housing Authority, among others. 77: Zutto, Japanese. Almost half as expensive as Nobu--more than half as good. 67 (corner): Built as New York Hospital's House of Relief (its downtown emergency room) in 1893, this was later the U.S. Marine Hospital No. 70. Since 1985, it's been residential, but the medical tradition continues with Tribeca Dental Health on the ground floor. 55 (corner): Washington Market School is in the a striking 1890 red-brick McKim, Mead and White building (though I've also seen this building attributed to Edward Hale Kendall). Actor Harvey Keitel has lived here. 51 (corner): An 1881 red-brick building by Stephen D. Hatch holds Babylicious, formerly Happy Baby Toys; Wm. B. May Co. Real Estate, established 1866; and H&H Building Consultants. This small piece of land was bought by the city from Trinity Church in 1797 for five dollars--the first land acquired by the city for parkland. In 1636, it formed part of the Annetje Jans farm, also known as Dominie's Bouwery, or "minister's farm," after Jans' second husband, Everardus Bogardus, who was the pastor of the Dutch Church. With the English takeover of New Amsterdam, the land ended up in Trinity Church's extensive landholdings. From 1871 until 1940, the park was landscaped to a design by Central Park's Calvert Vaux and park superintendant Samuel Parsons. A 1999 restoration attempted to bring back the spirit of the Parsons/Vaux design. 100 (block): Johns & Hicks 20th Century Furniture is in the Franklin-Hudson Building. 90 (corner): Downtown Wine & Liquors; Tribeca Luggage & Leather; Douglas Elliman Real Estate, a large firm affiliated with Prudential Life. 60 (block): A 1930 Art Deco landmark from Ralph Walker, who also designed what is now the AT&T HQ. Still houses many communications firms. 50 (corner): Was Lucius Pitkin, real estate firm founded 1885. 36 (corner): Mohawk Atelier is a high-end residential conversion of the old Mohawk Electrical building, an 1892 Romanesque Revival building, in combination with an 1845 whalebone factory on Duane. What am I missing on Hudson Street? Write to Jim Naureckas and tell him about it.